She took one of the new characters as her own name. At that time, it was taboo to say or write the name of high-status people. (It was thus a bit tricky to tell people whose name you couldn’t say or write!) This was a big deal: people (plus their families) got executed for disrespecting the emperor by saying their name or writing their name properly. One way around the writing problem was to leave out a stroke in the name, but if the name-character was common in other words, it could be difficult to work around the ruler’s name. Considerate emperors with common characters in their names frequently changed their name to something less common, but Empress Wu went a step beyond in using a hitherto-unused character. For the other characters, it is not clear why she insisted on their use instead of the perfectly good ones that were available. 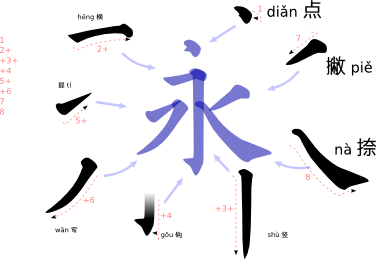 Interestingly, one of the characters, the one shown at the top of this post, uses none of the eight basic stroke shapes of Chinese script, and indeed looks quite un-Chinese. The characters did not catch on, and ceased being used quite promptly after her death. This entry was posted in government-mandated, inventor known, Logograms, Rating: 5 "Whoa!! ", significant female influence. Bookmark the permalink. Her family name is “Wu”, not “We” (which would be an impossible syllable in Mandarin, I think). Whoops! Typo, thanks for the catch.